Experience the closest thing to flying a magic carpet with your very own helicopter flight. Depart Redcliffe airfield and get immediate views of the spectacular Moreton Bay as you climb to follow the Redcliffe beaches at 500 feet. You will see Bribie Island to the north, the high-rise skyline of Brisbane CBD to the south and the Glasshouse Mountains to the north west. 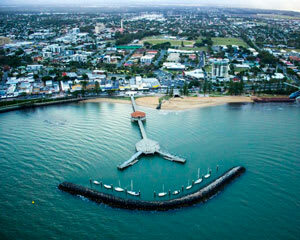 You'll continue to fly along the beaches past Scarborough Marina, Redcliffe Jetty and Suttons Beach before climbing up to 1,000 feet and turning toward the west flying over Redcliffe City. Please note there may be other passengers sharing the flight with you. loved the flight with Aeropower. They were brilliant, Warren the pilot explained how the helicopter worked etc. Also which part of the countryside we were looking at. Thank you for an awesome flight. Warren, the pilot at Airpower was brilliant - informative, educational and was a great host and made our experience even more worthwhile.